We are the Roman Catholic community in Isleworth. Isleworth has been a settlement since Saxon times. In the Middle Ages, it was the site of a magnificent Abbey of the Bridgettine Order. After the Reformation, Shrewsbury House was the location for one of the earliest Catholic missions in the south of England. The present church was opened in 1909. Its architectural style is from the Italian Renaissance. The interior was completely redecorated to celebrate the Millennium. The Isleworth Catholic community today is marked by its diversity. Between twenty and thirty countries of origin are represented, though the majority of our people come from England, Ireland and Scotland. Our homes are in Victorian terraced streets and villas, semi-detached houses from the 1920s and 30s, and post-war apartments; some are in high rise blocks and modern neo-Georgian developments. Most of our young children go to school at St. Mary’s Junior, Infants and Nursery School. Older students go to Gumley House, Gunnersbury and St. Mark’s Schools. Our sick and elderly are cared for in West Middlesex Hospital and in several residential homes. Some of us work in London, some at Heathrow Airport and others locally in commerce, transport and public services. Most of the community lives within the geographical boundaries of the parish but some travel in from neighbouring areas. We have a reputation for being welcoming and inclusive. Our style is informal. There are about 500 regular churchgoers at St Bridget’s. Father Green was an able and enterprising priest who had a gift for mobilising support. Like the Church as a whole, he gave priority to education and built a new boys’ school. The confidence of the Catholic community was growing at this time and under his leadership initiatives were taken that demonstrated that confidence and a desire to engage fully in civic affairs. In 1907, he started the annual outdoor procession in honour of the Isleworth Martyrs. He went on to organize the construction of a new church in a prominent position at a main road junction on the edge of the village. The new church was consecrated in 1910. A bell tower was added to the church in 1927 and a parish hall in 1931. Father Green died in 1929 and is buried in Isleworth Cemetery but the community and his successors have continued to build on the foundations laid in the period of his ministry. 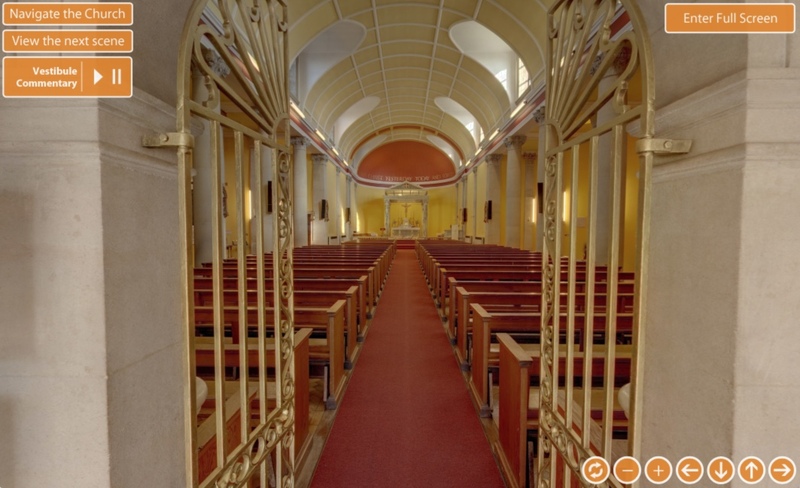 We are delighted to be able to show you around our church In a virtual tour. We’ve put together a short audio description for most scenes, simply click on the ‘play’ button in the top left corner to listen. You’ll begin in the vestibule, to change views simply use the floor plan button st the top left of the of the tour screen.Click on the button to go on your tour!